Apartheid is an afrikaans word meaning "seperateness" - it was a legal system whereby people were classified into racial groups - White, Black, Indian and Coloured; and seperate geographic areas were demarcated for each racial group. Apartheid laws were part of South Africa's legal framework from 1948 to 1994. Starring Tim Robbins, playing Nic Vos, a Africaner colonel in South Africa's brutal Special Branch struggling to maintain the status quo during apartheid's final decade. "Catch a Fire" is an action-political thriller with the look of a documentary, telling the true story of Patrick Chamusso, an apolitical family man who joined the African National Congress military wing after being repeatedly, and falsely, arrested and tortured. After training with the ANC in exile in Mozambique, Chamusso returned to South Africa to bomb the government-owned oil refinery where he worked. 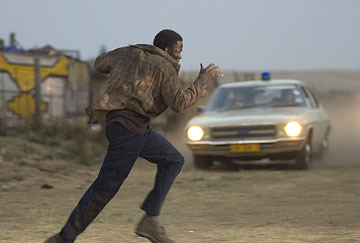 Nabbed after an extensive manhunt led, in the film, by Vos, he was sentenced to 24 years on Robben Island. Chamusso was released 10 years later when apartheid fell, a national hero whose message of forgiveness and reconciliation permeates the film. "Catch a Fire" is named after Bob Marley's song of liberation. PW (Pieter Willem) Botha dies (aged 90) of natural causes around 8pm at his lagoon-side home "Die Anker", near Wildernes in the Western Cape. He leaves behind his second wife Barbara, his daughters Elanza Maritz and Rozannee and his son Pieter. In a statement, the ANC wished Botha's family "strength and comfort at this difficult time". "I just exploded. I just went off on him, because he again started to tell me his side of the story. I caught on fire. When I calmed down, the others were just staring at me and I almost started crying. I said, 'I'm sorry -- I know we're making a movie here, but this is my home. This is Africa. I felt a great responsibility to tell the story in truth. I think what was really hurting was the fact that I was totally absent of Apartheid and ignorant of its existence. And during Apartheid, I don't even know what I was doing. Maybe thinking about going to Magic Mountain for a ride, or something." Derek Luke speaking about the filming of the apartheid movie "Catch a Fire". Walter Sisulu dies aged 91. Sisulu was a key figure in the anti-apartheid struggle. Dr Wouter Basson is acquited by the court, dubbed "Dr Death" he ran an apartheid-era germ warfare programme. Basson had faced charges of murder and conspiracy. The ANC condemns the verdict. "I will never ask for amnesty. Not now, not tomorrow, not after tomorrow," PW Botha after winning an appeal against the conviction for failing to heed the subpoena to appear before the Truth and Reconciliation Commission. The Truth and Reconciliation Commission releases its final report, a 3,500-page document which brands the apartheid-era government the primary perpetrator of gross human rights violations, but also holds the ANC and other anti-apartheid activists, including Winnie Madikizela-Mandela and her Mandela United Football Club, accountable for human rights violations. Nelson Mandela marries Graça Machel, the widow of Mozambique's founding president, Samora Machel. 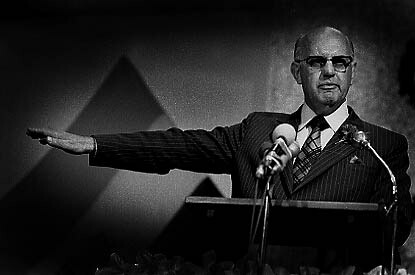 "In August 1985 President PW Botha had delivered what has become known as his Rubicon Speech in Durban. The world had been waiting for good news, important announcements on dismantling apartheid and releasing Mr Nelson Mandela. I myself drafted that part of the speech in which the phrase "today we have crossed the Rubicon" appeared. President Botha, however, retained the sentence but removed what had preceded it, namely the release of Nelson Mandela and the government's intention to dismantle apartheid. The effect of the speech on the world, and on many South Africans, was that of a bucket of iced water in the face." 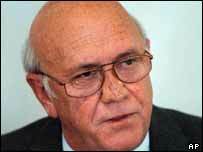 Former President FW De Klerk testifies before the Truth and Reconciliation Commission. Eugene de Kock, commander of the secret Vlakplaas unit of the security police during the apartheid government era, is convicted of six murders and 83 other crimes. Before he is sentenced, de Kock testifies that other senior members of the former government, including former presidents P.W. Botha and de Klerk and several army generals and police officials, were involved in dirty tricks against the anti-apartheid movement. The new constitution is adopted, which goes into effect in February 1997. The South African Human Rights Commission (SAHRC), a watchdog organization that derives its powers from the Constitution, is officially launched. The Khulumani Support Group is formed by survivors and families of victims of the political conflict of South Africa's apartheid past. It was set up in response to the pending Truth and Reconciliation Commission by victims who felt the Commission should be used to speak out* about the past to ensure that such violations never occur again. President Mandela signs a law creating the Truth and Reconciliation Commission to investigate human rights violations committed from March 1960 to May 1994. The commission is chaired by Archbishop Desmond Tutu and begins holding public hearings in April 1996, completes most of its fact-finding work by late July 1998, and releases a final report three months later. South Africa's commonwealth status is restored (although it remains a Republic). After the first multi-racial democratic elections, South African president Nelson Mandela is sworn in to office. The first multi-racial democratic elections. 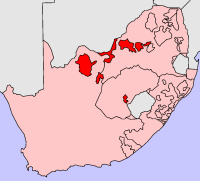 The 10 ethnically determined "homelands" of the apartheid era are incorporated into nine new provincial administrative regions. The Heidelberg Tavern in Observatory is attacked, with 4 people being killed. Ballistic tests indicate that the same weapons were used as in the St James Church massacre. APLA attacks the St James Church in Kenilworth with grenades and AK47s, killing 11 members of the congregation (including 4 Russians). A single member of the congregation, Charl van Wyk, returns fire with his .38 Special and wounds one of the attackers, resulting in them fleeing. Communist China resumes trading with South Africa (cut off since 1960). The United Nations General Assembly lifts economic sanctions against South Africa. A young American, Amy Biehl, is stoned and stabbed to death in Gugulethu after dropping off some friends. FW de Klerk and Nelson Mandela share the Nobel Peace prize for ending apartheid and laying the foundation for a multi-racial democracy in South Africa. Agreement on an interim constitution. South African Communist Party leader Chris Hani is assassinated outside his home. In October 1993, Polish immigrant Januzs Walus and former Conservative Party MP Clive Derby-Lewis are found guilty of the murder and are sentenced to death, later commuted to life imprisonment. The white citizens of South Africa vote in a referendum for government to negotiate a new constitution with the ANC and other groups. The beginning of multi-party talks. 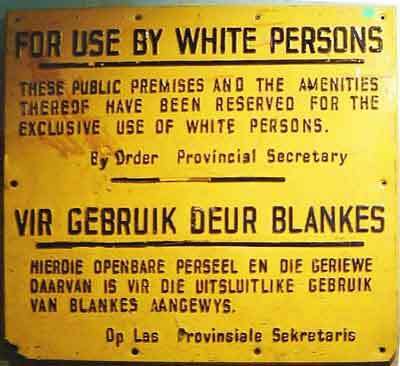 President F. W. de Klerk's government scraps South Africa's Separate Amenities Act, which had barred blacks from public facilities. President F. W. de Klerk's government repeals the Groups Areas Act, (which segregated residential neighborhoods); the Land Act, (which restricted blacks' rights to purchase land); and the Population Registration Act, (which classified the population by race). South Africa relinquishes control of South West Africa/Namibia, and it officially became an independent state on 21 March 1990. The musician, Miriam Makeba, returns to South Africa after spending 30 years in exile. President F. W. de Klerk releases Nelson Mandela from prison. After 27 years in prison, Mandela makes his first public speech in decades from the balcony of the Cape Town City Hall. President F. W. de Klerk lifts a decades-long ban on several dozen anti-apartheid organizations, including the African National Congress (ANC), the Pan-African Congress (PAC), and the South African Communist Party, and releases anti-apartheid activists from prison. F. W. de Klerk is sworn in as South Africa's President. Police stopped protestors, who were marching to parliament, with teargas, batons and a new weapon - a cannon shooting out purples dye (to make it easier to identify and arrest the protestors). Philip Ivey, a 25-year-old conscientious objector and treasurer of the End Conscription Campaign, climbed onto the armoured vehicle and pointed the cannon’s purple jet on the police. Purple dye stained the surrounding buildings, including the whitewashed walls of the historic Old Townhouse on Greenmarket Square and the National Party headquarters. Ivey said that the climbing on the armoured vehicle was a spur of the moment decision and he was scared he would be shot. The following day graffiti around Cape Town proclaimed "The purple shall govern". Eleven days later, some 30,000 people marched through Cape Town city without police intervening. At a caucus meeting Botha was asked to resign and FW de Klerk became acting state president the next day. The National Party wins a majority of the seats in the 1989 South African General Election (South Africa's last race-based election). PW Botha resigns after suffering a stroke and is succeeded later that year by Frederik Willem (FW) de Klerk (like Mandela, an attorney by training). PW Botha had a mild stroke. PW Botha gives the Sharpeville 6 a reprieve from the death sentence. The great mineworkers strike begins - an unprecedented 300,000 mineworkers down tools and go on strike, returning to work on the 30th August 1987. The National Party wins a majority of the seats in the 1987 South African General Election. Former Mozambican President Samora Machel dies in a plane crash on South African soil (in February 2006 South African President Mbeki called for a reopening of the apartheid era inquest into the crash). After being lured to their deaths by police Constable Joe Mamasela (posing as an MK agent) the 'Mamelodi 10' (a.k.a. the 'Nietverdiend 10') are killed. Mamasela had promised to take them to Botswana for military training. Instead Mamasela drove them (in a minibus) to Nietverdiend, where security officers ordered the men at gunpoint to get out of the minibus, and Commandant Dave Trippet injected them with a chemical. Now unconscious, they were bundled back into the minibus and driven to Bophuthatswana by Special Forces operative Diederick Jacobus Vorster. A limpet mine and an AK47 were placed into the minibus, an accident staged and the minibus set alight. The bodies were burnt so severely that identification was difficult, and there is some confusion about who was killed in this incident. Their bodies buried in a field in Winterveld, near Pretoria. What happened to the Mamelodi 10 was outlined when Jack Cronje, Jaques Hechter, Paul van Vuuren, Wouter Mentz and Roelf Venter testified before the Truth and Reconciliation Commission. The officers received amnesty, but Mamasela, who admitted to his role in the murders, never applied for amnesty. He was declared a section 204 witness, which means that he received indemnity from prosecution as long as he was a satisfactory witness. Mr Vorster testified that, following these operations, he had requested not to be deployed on such missions, both because of security concerns and because he did not believe that such operations were the proper function of a soldier. The USA introduces mandatory sanctions against South Africa. The Gugulethu Seven are murdered. "Pending agreement on investment restrictions with adequate international support, my Government has taken steps designed to ensure the faithful observance of the Code of Conduct for European companies with interests in South Africa… To enhance the Code's effectiveness even further, the Netherlands seeks to make it more comprehensive and to tighten up supervision of its application. Reporting on the observance of the Code is intended to become obligatory for Netherlands companies with branches in South Africa and contraventions of the Code's statutory provisions will result in sanctions being imposed on them. Also, the Netherlands has consistently advocated the establishment of a mandatory oil embargo against South Africa. Meanwhile my Government fully subscribes to the measure agreed upon with our partners in European political co-operation to cease oil exports to South Africa. Furthermore, my Government actively encourages Netherlands companies to reduce their imports of South African coal." "'The Government… does everything possible to prevent international sporting contacts between Ireland and South Africa and refuses to give financial aid to Irish sports organizations which engage in contacts with South Africa. The Government has also prevented representative South African teams from taking part in sports competitions in Ireland." "In accordance with those resolutions, Austria has adopted the following unilateral measures: first, to suspend all investments in South Africa by Austrian public enterprises; secondly, to prohibit the import of krugerrands and all other gold coins minted in South Africa; thirdly, to impose restrictions in the field of sports and cultural relations; fourthly, to stop Government guarantees for export credits until further notice; fifthly, to prohibit the participation of public enterprises in South African procurement procedures in the nuclear field; and, sixthly, to prohibit all exports of computer equipment that might be used by the South African army and police. "Austria has also taken further steps to tighten the arms embargo against South Africa, and it observes the ban on imports of arms from South Africa recommended by the Security Council." discouragement of all cultural and scientific events except where these contribute towards the ending of apartheid or have no possible role in promoting it." Japan decides to prohibit the export of computers "that might assist the activities of such organizations as the armed forces and the police which enforce apartheid." Belgium requests SA to remove its military attaché from Brussels. urging Canadian banks to ban loans to the South African government and its agents. urging Canadian companies to ban the sale of crude oil and refined products to South Africa. a ban on all new co-operation in the nuclear field." In accordance with an executive order of the President of the USA, loans to South Africa are banned, excluding "loans which improve economic opportunities, or educational, housing and health facilities that are open and accessible to South Africans of all races." In accordance with an executive order of the President of the USA, banning the importation of the krugerrand in the United States. banning computer exports to police, military and security forces and agencies "involved in the enforcement of apartheid." Banning the import of military vehicles or arms produced in SA. prohibiting the export of nuclear technology except those required to carry out international agreements on the spread of nuclear arms, or those deemed necessary to protect public health and safety. "(g) Direct investment by the South African government or its agencies in Australia has been prohibited. "In addition, the Government has placed an embargo on all new government contractual dealings with majority-owned South African firms for contracts above $ 20,000 and has decided to terminate all export facilities available through the Export Finance Insurance Corporation, the Export Market Development Grant Scheme and the Australian Overseas Projects Corporation and certain industry assistance to such firms. "The Government has decided also to avoid government procurement of supplies from South African sources save that necessary for the maintenance of Australian diplomatic and consular representation in Southern Africa and to restrict government sales of goods and services to South Africa." "7. Commends those States which have already adopted voluntary measures against the Pretoria Government and urges them to adopt new provisions, and invites those which have not yet done so to follow their example." Denmark prohibits new Danish investment into South West Africa - Namibia or South Africa. South African armed forces attacked Botswana. Lesbian and Gays Against Oppression (Lago) founded. Sweden bans loans and financial leasing to South Africa. Police in Langa opened fire on blacks marching to mark the 25th anniversary of the Sharpeville shootings. At least 21 demonstrators were killed. Sweden extends its embargo against apartheid South Africa to include data processing equipment and the export of fuel to the South African military or police. "9. Appeals to all Governments and organizations to take appropriate action for the cessation of all academic, cultural, scientific and sports relations that would support the apartheid regime of South Africa as well as relations with individuals, institutions and other bodies endorsing or based on apartheid and also appeals for further strengthening of contacts with those opposed to apartheid." Denmark bans military imports from South Africa. France bans new investment into South Africa. Sweden introduces an embargo against the import of military material from South Africa. The United Democratic Front, a coalition of almost 600 organisations, is formed to persuade the Government to end apartheid. White South Africans vote "yes" for a tricameral parliament that included coloured and indians, but excluded the black majority (and whites held the majority of the seats). Belgium ceases its visa-free privileges for South Africans. Sweden starts denying visas to South Africans representing the apartheid regime in the areas of sport, science or culture. Dr Neil Aggett became the 45th South African to die in police detention (and the first white person to die in police detention) under apartheid. Dr Aggett was reported by police to have been found hanged at Johannesburg's notorius John Vorster Squre. On the 4th February 1982 Aggett had written an affidavit claiming he had been tortured, assaulted, deprived of sleep and beaten on various occassions since his arrest. Aggett had joined the trade union movement in the sixties and fought for the rights of black workers to be placed with company-supported medical aid schemes and enjoy other democratic rights. 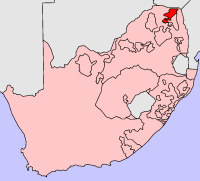 Ciskei is declared independent. 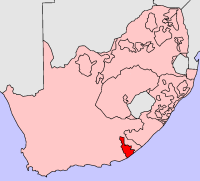 The independence of Ciskei was only ever recognized by South Africa and other South African homelands (Transkei, Venda, and Bophuthatswana). The National Party wins a majority of the seats in the 1981 South African General Election. not providing exports to South Africa with export credit insurance. "Under Italian legislation, only the export of military aircraft is subject to Government licence, but in the case of South Africa this regime of controls has been extended to civilian aircraft since 1972. The Italian Government has refrained since 1972 from issuing export licences for components parts of both MB 326K aircraft and the Rolls Royce 'Viper' engine." Canada withdraws South Africa's "Commonwealth trade preferences". Umkhonto we Sizwe bombed Sasol's Secunda plant, along with 2 other Sasol installations. Patrick Chamusso was arrested in the aftermath of the bombs, as he was one of the last drivers to leave the area at the Secunda plant where the bomb was placed, and police were looking ANC operatives inside Sasol who helped the MK operatives gain access to the plant. Police at the time had the power to hold people suspected of political crimes indefinitely, without access to a lawyer or family. Torture was routine. When Patrick was unable to produce an alibi, he was tortured and jailed; when he refused to admit guilt for an act he didn't commit, the officer ordered his wife, Precious (Bonnie Henna), to be tortured as well. Patrick was detained for two weeks and had a bad time. He came out a changed man. Patrick had by now had 2 run-ins with the police, despite the fact that he had avoided any kind of political involvement all his life. He had been though hell for doing nothing. The South African government bans Pink Floyd's "Another Brick in Wall" (Part II), being blamed for inciting riots among pupils. Black children who boycotted schools because of inferior education standards had adopted the song as their anthem (the song includes children chanting the chorus, “We don't need no education”). Venda is declared independent. The independence of Venda was only ever recognized by South Africa and other South African homelands (Transkei, Ciskei, and Bophuthatswana). Austria revokes its visa agreement with South Africa, reintroducing the requirement for South Africans to apply for an entry visa. Following the "Information Scandal", BJ Vorster quits. The UN General Assembley adopts resolution 33/183 urges to stop financial loans to South Africa. Denmark and Norway introduce visa requirements for South African citizens. Canada starts denying visas to South African athletes and officials of South African sports to attend sports functions, and introduces visa requirements for all South Africans visiting Canada. BJ Vorster becomes state president and PW Botha is prime minister. withdraw EDC foreign investment insurance facilities for Canadian investments in South Africa. Spain ends its visa agreement with South Africa. Bophuthatswana, consisting of 7 seperate parts, is declared independent. The independence of Bophuthatswana was only ever recognized by South Africa and other South African homelands (Transkei, Ciskei, and Venda). "5. Calls upon all States, including States non-members of the United Nations, to act strictly in accordance with the provisions of the present resolution; …"
South African black student leader Steve Biko is murdered in police custody in Pretoria. His hearse is pulled by oxen to his burial (attended by 20 000 people) on the 17th September 1977 in King Williams Town. Biko had been arrested on the 18th August 1977 in King Williams Town, under the Terrorism Act No 83 of 1967. A Soviet Union surveillance satellite discovers a nuclear weapons testing site in the Kalahari region of South Africa, the Soviet Union sends the satellite over to take more detailed photographs in 4 different passes over the site a week later. At a press conference in August 1977, the Soviet Union provides exact coordinates of the site. SA government spokesmen dismiss it as Soviet propaganda. Australia's labour government decides to stop Qantas flights to South Africa (SAA flights to Australia are allowed to continue). Winnie Mandela is banished to Brandfort, in the Free State. The National Party wins a majority of the seats in the 1977 South African General Election. Originating with Sweden, the UN General Assembley adopts resolution 3l/6K which requests the UN Security Council "to consider steps to achieve the cessation of further foreign investments in South Africa." Transkei is declared independent, becoming the first black homeland in South Africa. Transkei is a largely isiXhosa-speaking area between the Kei river and what was then called Natal (now KwaZulu-Natal). The independence of Transkei was only ever recognized by South Africa and other South African homelands (Bophuthatswana, Ciskei, and Venda). The word "Transkei" means the "area beyond the Kei". On Wednesday, 16th June 1976, Soweto pupils revolt against the apartheid education system, where they were forced to be taught in Afrikaans (as their medium of instruction). The iconic image of the riot is the photo of 13-year-old Hector Pieterson being carried away after he was shot by police (taken by Sam Nzima). Children protesing with banners were attacked by police firing teargas. The children replied by throwing stones and the police replied with shots. At a meeting at Orlando DOCC to address the Phuti class boycott, it was decided to stand up to the "boers" and stage a school boycott on the 16th June 1976. Belgium ceases providing assistance to anybody emigrating to SA. The National Party wins a majority of the seats in the 1974 South African General Election. The United Nations declares apartheid "a crime against humanity". The Afrikaner Weerstandsbeweging (AWB) is founded. It is announced by the SPCA in Cape Town that, according to a government ruling, it is allowed to accept only the pets of white owners at its boarding facilities! Black Homeland Citizenship Act, changing the status of the inhabitants of the 'homelands' so that they were no longer citizens of South Africa, and therefore had none of the rights that came with citizenship. By undertaking the appropriate action to give effect to the above measures." The National Party, led by John Vorster, wins a majority of the seats in the 1970 South African General Election. 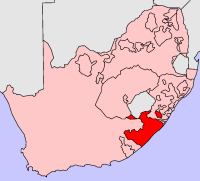 District Six is declared a white area. BJ Vorster succeeds Hendrik Verwoerd. On the 6th September 1966, Hendrik Verwoerd is stabbed to death by a messenger, Dimitri Tsafendas, in parliament. Tsafendas forced his way into the gallery, where he was not allowed, and stabbed Verwoerd 4 times. Verwoerd was buried in Pretoria. Tsafendas escaped death claiming insanity, saying that a large worm in his stomach told him to kill Verwoerd. Robert Kennedy delivers a speech in Cape Town. The National Party, led by Hendrik Verwoerd, wins a majority of the seats in the 1966 South African General Election. With the Labour Party coming into power, the UK announces an arms embargo against South Africa. South Africa is banned from the Olympic Games. Eight Rivonia trialists (including Nelson Mandela) are sentenced to life imprisonment for treason and sabotage. Eddie Daniels begins a 15 year prison term on Robben Island. While in prison, Daniels graduated from high school and received BA and B.Com degrees from the University of South Africa (UNISA). On Daniels' release in 1979, he was placed under house arrest and banned for a further 5 years. 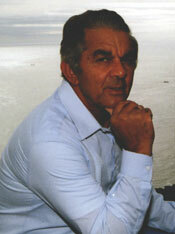 After his house arrest Daniels taught in Cape Town until his retirement in 1993. UN Security Council Resolution 182 calls on all countries "to cease forthwith the sale and shipment of equipment and materials for the manufacture and maintenance of arms and ammunition in South Africa." UN Security Council Resolution 181 calls on all countries to " cease forthwith the sale and shipment of arms, ammunition of all types and military vehicles to South Africa." Other than existing contracts which are allowed to continue, the USA announces a total arms embargo on SA. All of musician Miriam Makeba's records are banned in South Africa, after an impassioned testimony before the United Nations Committee Against Apartheid. The exiled leadership of the PAC (Pan African Congress) declares the beginning of a revoluationary war spearheaded by its armed wing, Poqo. Additionally, a Special Committee against Apartheid is formed under the resolution. November 1962: Nelson Mandela is sentenced to 5 years imprisonment for illegally leaving the country and incitement to strike. He had been on the run for 17 months before he was captured, resulting in him being known as 'the Black Pimpernel'. Years later a retired agent was quoted in the New York Times as saying that the CIA had tipped off the South African security police about Nelson Mandela's whereabouts. Umkhonto weSizwe is founded, with Nelson Mandela heading it. Albert Luthuli becomes Africa's first winner of the Nobel peace prize. After quitting the Commonwealth, South Africa becoms a republic. The National Party, led by Hendrik Verwoerd, wins a majority of the seats in the 1961 South African General Election. On the 9th April 1960, 3 weeks after the Sharpeville massacre, David Pratt (a wealthy farmer) shot Prime Minister Hendrik Verwoerd while he was opening the Rand Show in Johannesburg. 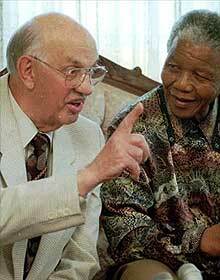 Verwoerd had just finished a boring speech, when Pratt stepped forward and shot him at point-blank range. Verwoerd survived the assasination attempt, and Pratt hanged himself in a Bloemfontein mental institution. The Sharpeville massacre on the 21st March 1960. Police opened fire on people protesting (outside a police station in Sharpeville in the Vaal Triangle) against the pass laws, resulting in 69 people being killed and 180 wounded. Baragwanath hospital had been reduced to a war zone. Baragwanath housed 143 survivors - men, women and children - under police guard. Surgeons are shocked by the wounds - normally only seen in battle - multiple gunshot wounds, bones powdered by heavy callibre bullets. Many wounds were inflicted from the victims' backs. Of the 143 admitted; there were 110 men, 29 women and 4 children. Three of those admitted to the hospital died. The bodies of those who died were brought by truck to a mass funeral. 3 February 1960: Britain's MacMillan visits parliament in Cape Town and delivers his 'Winds of Change' address. "The wind of change is blowing through this continent. Whether we like it or not, this growth of national consciousness is a political fact....As a fellow member of the Commonwealth it is our earnest desire to give South Africa our support and encouragement, but I hope you won't mind my saying frankly that there are some aspects of your policies which make it impossible for us to do this without being false to our own deep convictions about the political destinies of free men to which in our own territories we are trying to give effect." Click here to read Hendrik Verwoerd's response to the 'Winds of Change' adress. Es’kia Mphahlele publishes his memoir, “Down Second Avenue”, illustrating the injustices of apartheid. The memoir covers his early childhood and manhood. Led by Robert Sobukwe, the Pan Africanist Party (PAC) is formed. The National Party, led by Hendrik Verwoerd, wins a majority of the seats in the 1958 South African General Election. The Promotion of Black Self-Government Act, which set up independent "homelands" for black people (in practice, the apartheid government had a strong influence over these homelands). The Mines and Work Act, formalising racial discrimination in employment. The National Party, led by DF Malan, wins a majority of the seats in the 1953 South African General Election. The Bantu Education Act, designed to reduce the level of education attainable by black people. The South African Communist Party is banned. The Group Areas Act, barring people of particular races from various urban areas. The Population Registration Act, requiring all citizens to register as black, white or coloured. Patrick Chamusso is born in Mozambique. Amendment to The Immorality Act, making it a criminal offence for a white person to have any sexual relations with a person of a different race. The ANC Youth League's 'Program of Action' is adopted by the ANC at its annual conference. The program advocates the use of strikes, boycotts, civil disobedience and noncooperation to achieve full citizenship and direct parliamentary representation for all South Africans. The National Party wins the most seats in the 1948 South African General Election on its policy of racial segregation (later to become known by the afrikaans word Apartheid) and comes to power. PW Botha is elected to parliament for the first time as a members of the Herenigde Nasionale Party - Botha will later become President of South Africa. India severs trade relationships with the Union of South Africa, in protest against its discriminatory treatment of people with an Asian origin. Secret Broederbond is formed to advance the Afrikaner cause. 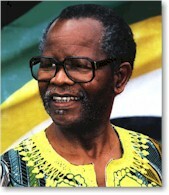 Oliver Reginald Tambo is born in Mbizana, a rural town in eastern Mpondoland in what was then the Cape Province (now Eastern Cape). The first recorded use of the word "apartheid", in a speech by Jan Smuts. Ghandi is arrested for the first time in South Africa. The Land Act is introduced, which prevent blacks (except those living in the Cape Province) from buying land outside reserves. Mohandas 'Mohatma' Ghandi (a Hindu) leads 3000 Muslims, Hindus and Christians to burn their passes in the courtyard of the Hamidia Mosque in Newtown, Johannesburg. Mohatma Ghandi coins the term "Satyagraha" to describe South Africa's non-violent movement. The Chinese Exclusion Act is passed. Hendrik Frensch Verwoerd is born in Amsterdam. End of slave "apprenticeship", which started in 1834. Slavery is abolished and slaves become "apprentices" for 4 years. A curfew existed for slaves, who had to be indoors by ten o'clock at night. If they were out later they were required to carry a pass and a lantern. Slaves were not allowed passage through the streets of Cape Town on horseback or in a wagon. Slaves were forbidden to sing, whistle, or make any kind of sound at night. Slaves could not enter public houses or bars (taphuis). Slaves could not congregate in groups on public holidays. Slaves were not allowed to wait near a church entrance during service. Slaves could not stop to converse on the streets of Cape Town, at risk of being publicly caned. Slaves who made false claims or insulted freemen of the Cape were to be punished by public flogging and to be held in chains. Slaves who proffered violence to their masters were to be put to death, no mercy may be shown to such offenders. The first slave in the Cape Colony, Abraham van Batavia, arrives.